There comes a time in every young boy’s life when he’s invited to mount a gallery show of his work. When the call came for me—courtesy of Terrill Thomas and Timothy Musso at Brandstater Gallery—I was (in this order) delighted, intrigued by and then scared to death of the possibilities, and ultimately forced to sit down and think of something both entertaining and viable. The phrase “Everything is going exactly as planned” had come to me previously as a possible headstone inscription—I like to plan ahead—but now it seemed like an even better title for a retrospective. But a retrospective? Meh… I didn’t just want to recreate my portfolio website in a gallery space. The gallery—part of La Sierra University in Riverside, California—is about two hours drive from Los Angeles. I went on the assumption that only my close friends would make the journey, and they know my work already. I owed them something different. Besides, projects that send me to the archives for long periods of time sometimes make me feel like the executor of my own estate. It can get depressing. But what about a retrospective of my entire life’s work—from birth to my mysterious disappeareance in the year 2075? All I’d have to do would be to create sixty years of my future work by opening day. What could be simpler for a veteran time traveler such as myself? When compared to the idea of conceiving a room full of simply new work, this struck me as the soft option. Of course, what followed were four months of hand-wringing, false starts, and a two-month sprint to the finish line. I’ll talk about the process behind some of the more complicated pieces in separate posts, but for now, please allow me to give you the nickel tour of the show as it opened on 21 February 2015. Fair warning: Ninety years of work will require some scrolling. Right away we’ve got ourselves some inconsistent branding. I’d spent considerable time on a fairly ornate way of lettering the show title, but I wanted that to be a big reveal in the gallery. I didn’t want to give it away in the promo materials. For the postcard I resurrected a type treatment I’d created for a client earlier in the year. It got rejected then, but it had always been my favorite. I was happy to bring it back to life. Tim raised the possibility of a large event banner. Who’d say no? Of course, a 140-square-foot white page sent me into a little swirl of option paralysis. Intially, I wanted to use a photo of myself as an old man, but then I remembered what Randy Newman said about wearing KISS makeup on the cover of his Born Again album. “The mistake I made was that to do this, people have to know who you are in the first place.” I went for legible and mildly funny text instead, in the hopes of attracting passing students. Aesthetically, that green color has nothing to do with the rest of the show, but I wanted something bright and happy on the building. Who wants to see a downer show? The invitation card went to people who know me, so I could play it a bit more serious and rest assured that my friends would see the humor. The black rectangle is a little nod to the gravestone origin of the show title. And there’s a subtitle to the subtitle. That’s just bad writing is what that is. My apologies. A minor figure in graphic design and illustration during his lifetime, Stefan G. Bucher has emerged as one of the more interesting and confounding personalities of his era. Following his disappearance in the year 2075, he was quickly forgotten and only entered the public consciousness again when his name appeared in the unsealed archives of ███████ president █████ J. █████, linking him to the disastrous events of the great ██████ of ████. Subsequent investigation revealed that Bucher’s personal papers had been seized and classiﬁed by the Terran Harmony Council. A heaviliy sanitized, pleasantly anodyne version of his life story had been substituted to avoid a conspicuous absence of information in the WikiSphere. On the 250th anniversary of Bucher’s birth, we are proud to ﬁnally present you with this ﬁrst glimpse into his uncensored* archives. May this exhibition serve to restore Bucher from a footnote of history to his rightful place as an interesting footnote. * This exhibit is made possible by the Lower California Arts Administration and the Universal Time Travel Authority. Information that may lead to critical timeline alterations will be automatically redacted to match your time travel clearance. Please have your ChronoPass™ with you in all times. A view of the past, which you can’t change, and the near future, which you can. Just be careful, please? You cannot change the past, but you can spin this ambigram wheel, as demonstrated here by Brandstater Gallery director and expert wheel builder Tim Musso. 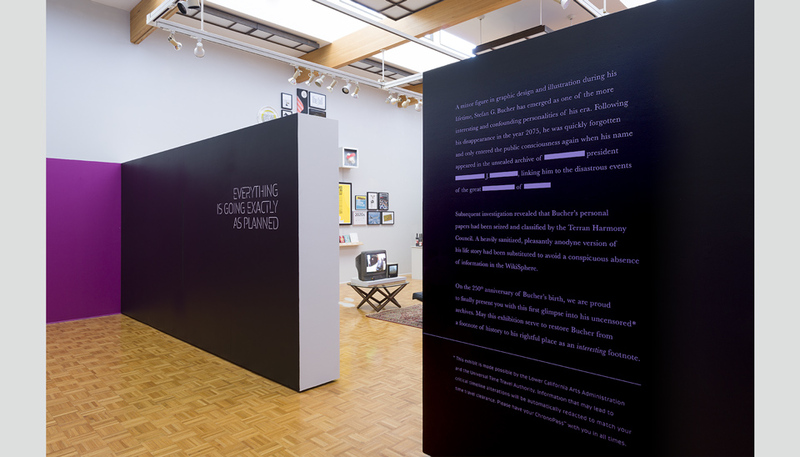 The visual centerpiece of the show is a big typographic mural of the title. I’d seen some graffiti artists paint into corners, so that the design looks as if it’s floating if you stand in the right spot. I liked the idea that you have to find that exact vantage point for things to look right and make sense. That’s the essence of the show: You can’t see the shape of your life until you’re in the right spot. Until then everything looks distorted and out of place. The future is revealed. It includes a big pink mural of the show title painted over the course of three days. Beyond that, I liked that the mural would be a great photo opportunity for visitors. I figured that only a small number of people would see the actual exhibit, so I needed things that look great on Instagram. Tim and student volunteers Leslie Escudero and Grace Saunders painted the pink wedge and the Prada-esque red stripe. Dig that high-tech drop shadow! Tim, Maureen Perry and I then spent three days outlining the type with masking tape and filling it in. Lastly, we were joined by Terrill Thomas who helped us pencil in the corner shadows. I like a nice painting marathon. Really makes you feel that you’ve done something. The mural as seen from the sweet spot, in line with the original projector position at the original projector height of 5 ft. 10 in. Please note Conan O’Brien’s golden Stratocaster guitar in the foreground. Of course, I’m still a creature of print, so I wanted a poster to go along with the show. As with past posters I felt that it should be a gift, not a promo, so I kept it to just the lettering with a blind-embossed 344 seal and my signature in pencil. The pink is a double hit of fluorescent PMS ink to make the color extra intense. Typecraft printed a commemorative 24 x 18 in. (45.7 X 61 CM) poster for the event. The far future reveals my most ambitious plan—the moving of Mars—as well as my personal exit strategy. Mock-up vs reality. Details changed, but it was fun to see a plan come together. Throughout the show, my personal story is explained decade by decade. Everything you read here is true, or will be eventually. There may be minor embellishments, but it’s not the things you think. One of the nicest parts of the opening reception was answering questions about what actually happened in my past. For the record: 97.1% of my past is true. The one thing almost everybody assumed to be real was my baby picture. It is not. I didn’t wear a pith helmet until 3rd grade. Most examples of my Frühwerk were, indeed, destroyed in a move. The loss to Western civilization will continue to reverberate for centuries. Two entirely true things that happened in the 1980s: I was praised publicly for my forged autographs by Konrad Kujau, infamous author of the counterfeit Hitler Diaries, and I was pen pals with Goldfinger. For my past work I made a real effort to include a lot of things that aren’t on this site and hadn’t been seen by most people—a line of embroidered shirts that was sold all over Europe in the early 1990s, for example, and student work from my time at Art Center College of Design. Right after graduation I was hired as an art director at ad agency Wieden + Kennedy, and got a steady gig designing for Madonna’s record label Maverick Records after that. Good decade, the 90s. I met some fascinating people! Some of my student work for Lego, Timberland boots, and Volvo. As you’ll remember from the introductory text, it’s necessary to redact some of the information in my story as we move into the future. My work with the Echo Park Time Travel Mart has taught me that timeline pollution is a very real danger. Smaller paradoxes tend to resolve themselves without incident, but when walking on the sands of time one had best tread lightly. A guitar for future 344 client Conan O’Brien. Of course, the gilded Stratocaster displayed in the show was merely a prototype. The finished guitar rests in the Conan O’Brien presidential library in Boston. Livery design for Virgin International’s all first class 747-900 for 344’s future client Richard Branson. In the 2020s, I’ll begin to become active in social causes, and will continue my involvement in the chocolate arts. At the beginning of the decade I’ll partner with geneticist J. Craig Venter and space pioneer to develop genetically modified skin pigmentation that can be activated at will, with the purpose of protecting astronauts against radiation damage. Beyond this primary use, people soon discover that they can change their skin to display all kinds of designs, and genetically activated tattoos will become the latest fashion craze. Forget the i-Watch. What about i-Skin? In the aftermath of the Water Wars I’ll turn inward for a little while, and release a blues album. It was bound to happen. People underestimate how much downtime there is during periods of political and social upheaval. What better time to learn an instrument? The album will also be one of the first recordings released in the new Hyperdisc® Format. It’s a bit unwieldy, perhaps, but what sound quality! Logo for Elon Musk’s space elevator company Space-L, and my genetically modified dog Can Opener. Turns out that all you need to do is continuously bombard Mars with asteroids for seven years. You’ll need a cheap way of getting into space, so you can outfit asteroids with engines built in space. Something like a space elevator, say… And you’ll need some sort of genetically activated skin pigmentation to protect against radiation damage during long space missions. See how it all fits together? Oh, and the new orbit will give Mars a 344-day year. So many happy coincidences! Can you believe it? The whole Mars idea was sort of a quick idea for the end of the show, a little tongue-in-cheek megalomania. I wanted to reveal that 344 has been the cover for a powerful secret society all along, and moving a planet into a 344-day orbit seemed like the perfect bit of Dan Brown style lunacy. At the same time, I’m a big fan of plausibility, so I asked Jim at what distance from the sun Mars would have the correct orbit for the 344-day goal. Not only did Jim get back to me with the exact answer within minutes, he immediately got into the science of actually making it happen. Would it be feasible to build one gigantic propulsion system and strap it to the planet? The major issue there is establishing and maintaining a magnetic field to contain the exhaust. We don’t have computers fast or powerful enough. So Jim came up with a theoretical framework to build one. But he felt that bombarding Mars with asteroids was a much more elegant solution. It would require far less future tech and would introduce a new reserve of water to Mars in the process. I arbitrarily specified the maximum allowable rock temperature to be 2500 degrees C. This high temperature produces great radiation which goes as temperature to the fourth power. After the 7 years then the body is still at 2500 degrees and will take some time to cool down to a livable temperature. This cool down will be exponential. So it will cool quickly at first then slower and slower. I have some of the programs needed to find out how long this will take, but heat diffusion where each layer of the sphere is at a different temperature is a difficult problem. In the end, Jim figured out that it would take 8,405.5984 years to cool Mars to 99.99° Centigrade, so that we could have liquid water again. That’s not a trivial amount of time in human terms, but the 344 Organization plays the long game. Jim’s dedication to the premise was so excellent and inspiring that I included his (properly redacted) messages in the show and expanded the whole Mars project to be a proper grand finale. Sometimes it all comes down to asking the right question of the right person at the right time. Below are two versions of concept arts to illustrate the new evening sky with Mars in its new position. The revision requests were added by chief mission architect James Whitney. The image on the right is scientifically accurate. Following the success of Project ██████ I’ll be taking a little breather. As chocolate will have become extinct by the 2070s, and with synthetic chocolate still lacking in the taste department, I’ll develop a chocolate substitute based on tree bark. Even better than the real thing? Not quite, but a long-running ad campaign of celebrities barking like excited dogs make the Barky Bar one of the top sellers in the candy sector. You bark, I bark, we’re all barking for Barky Bars! Full of rich, barky goodness! In my 10th decade, I’ll spend a fair amount of time winding down my worldly affairs, and reconnecting with colleagues and loved ones. A few days after my 102nd birthday, friends will come to look for me in my studio, but they will find me gone. All that will be left is a pile of clothes, a smudge on the wall, and my glasses resting on a handwritten note: Everything is going exactly as planned. Putting it all together took a ridiculous amount of effort from all involved. Simply loading all the work into the gallery and getting it mounted was a mad last-minute dash and continued just past the arrival of our opening night guests. Along the way I experienced several moments of “I know why I’m doing all of this, but why are you still here at 4am?” I remain baffled and delighted by everyone’s enthusiasm and sheer stamina. Thank you to everybody who gave freely of their time and energy! And thank you to everybody who came to see the show (including the Brandstater family, who established and endowed the gallery! Thank you for letting me take over your beautiful space for a month!) It was a pleasure! Now my challenge will be to let it all come to pass, and to act surprised when it does.